Developing exhibitions with compelling installations, cutting edge technology, participatory art, and educational content. All Good Things... group exhibition featuring (from left to right) Heather Sparks, Christine Elfman, Berndnault Smilde, and Michael Zheng. CAS seeks to explore the critical issues of our time curating from a diverse range of artists across the spectrum of age, race and gender identity. Often focusing on contemporary art relating to immigrant artists or those identifying with diasporic or oppressed communities, CAS sees art as a tool for empowerment, for promoting equity, and establishing access to resources and perspectives withheld from minority communities. Installation by JD Beltran and Scott Minneman as part of Electronic Pacific. Collective Action Studio has expertise in exhibition design, installation management, authoring text, and all aspects of curatorial practice for nonprofit, educational and commercial enterprises. Experience ranges from curating monthly exhibitions at major cultural establishments to selecting work for art fairs, public programs, special commissions and festivals. Projected Personae featuring Heather Cassils, Krisztina Lazar, and Pamela Z. Seeking Civilization curated with Gallery Wendi Norris featuring (left to right) Miguel Angel Rios, Adrien Segal, Michael Arcega and Val Britton. 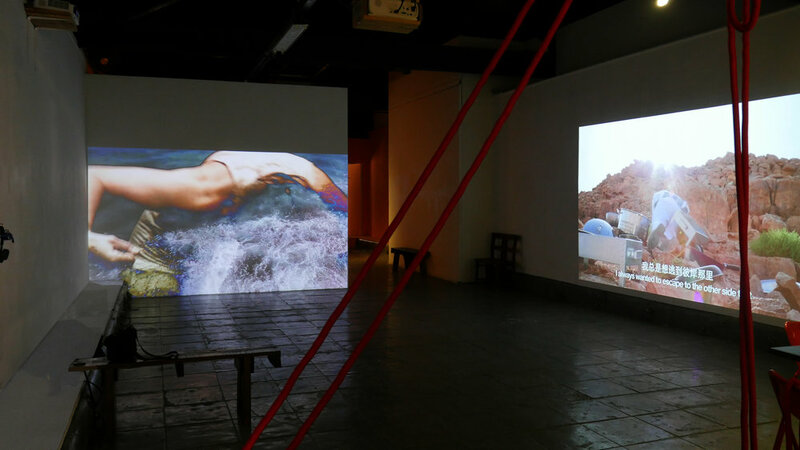 Group exhibition Electronic Pacific at Fei Contemporary Art Center, Shanghai, China. Seeking Civilization with Gallery Wendi Norris featuring (left to right) Omar Mismar, Taraneh Hemami, and Guillermo Galindo. Tony Labat at Pacific Northwest College of Art's It's All A Blur, a part of the Portland Time Based Arts Festival. Group exhibition I Am Crime: Art on the Edge of Law. Murphy and Cadogan Award Exhibition with the San Francisco Foundation, featuring Li Ma in foreground. Jacqueline Gordon and Laetitia Sonami in Electronic Pacific. Allison Wyper's 4 minutes of Hate at the 100 Performances for the Hole. Unlandscape at the Santa Cruz Museum of Art and History featuring Tra Bouscaren and Jeremy Morgan. Everybody's Ocean at the Santa Cruz Museum of Art and HIstory, a mega-democratic group exhibition adopting the salon style for a sense of inundation. Visual scores by Guillermo Galindo being activated by guitarist Henry Kaiser as part of the exhibition Site-Sound at the Santa Cruz Museum of Art and History. Installation of historic archives from University of California Santa Cruz redesigned as an installation. Ghost Shows with Tra Bouscaren at the Santa Cruz Museum of Art and History.